1. “Keeping it together. 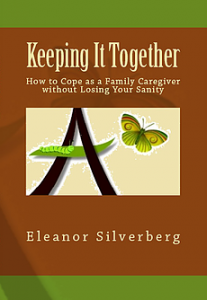 Find how to cope as a family caregiver, without losing your sanity”. Eleanor has recently published her second book for caregivers. Her book focuses on your welfare as the care provider for a chronically ill family member. A must-read if you do not want to lose yourself in the caregiving world or if you are losing yourself and need to find your way to move forward with more resilience to ‘keep it together’. Silverberg combines compassion and innovation in providing tools to tackle common but often unspoken challenges that family caregivers face and in providing an opportunity to come out the other end more personally enriched. There are a variety of workshops available to family caregivers. They are fun, educational and supportive. Eleanor is hosting an important family caregiver community symposium on October 1, 2016 in York Region. It will be an afternoon of educate, support and networking. Due to her strong grief background, coming from over 20 years of academic and independent study, she has seen the impact of loss and grief in the circumstances that caregivers experience. This view is different from the conventional cultural views related to loss and grief. To share this view, she developed the ground-breaking 3-A Grief Approach. In addition to professionally drawing from a strong academic grief background in assisting dementia family caregivers, she also draws from personal experience having been a family caregiver herself. Being a Child of Holocaust Survivors, she had a lot of exposure to loss. Most of her mother’s and father’s family members perished in the Holocaust. She experienced this trauma as a second generation offspring. Upon reflection, she attributes her initial pursuit in grief studies to her attempt at making sense of her own personal experience. She acknowledges that others could be assisted as well.